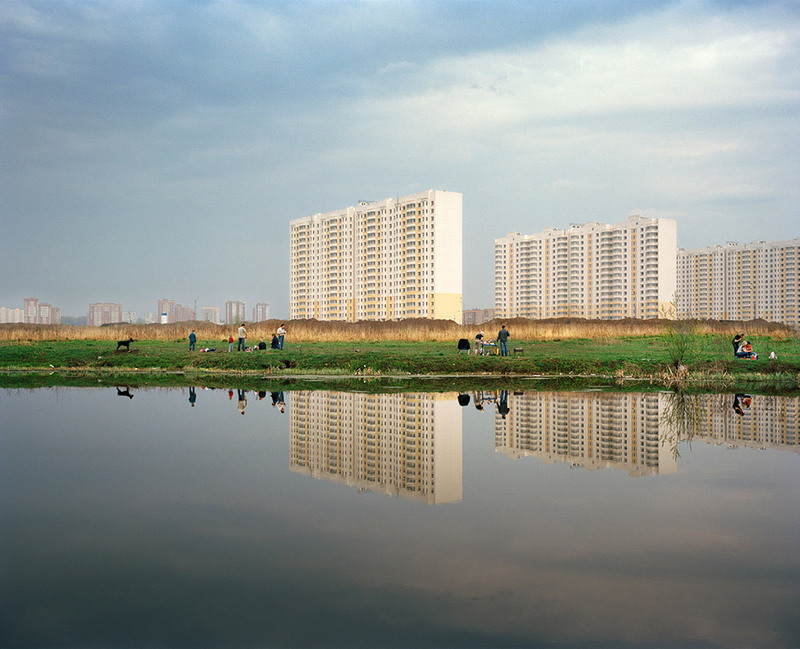 In the Pastoral cycle, Alexander Gronsky captures the intermediate zone between the metropolis – the Russian capital Moscow – and nature – already vanished. This is not the city, yet neither is it the countryside. These are a series of landscapes of the outskirts of the city, often taken from outside – from the overgrown wastelands and rubbish dumps, the no man’s land surrounding the town. The landscape is often separated from the observer, barring entry. The remoteness of the landscape is often linked to its ability to reveal to the viewer a self-enclosed aesthetic totality, i.e. something possessing form. In Gronsky’s cycle, however, this space between the photographer and the landscape is presented literally in the form of an intermediate zone of litter and inde niteness. With their clear geometric forms, the buildings in Gronsky’s cityscapes appear to differ greatly from the intermediate zone. Their role is to mark out the border between the space of desolation and the space of habitation. Yet this does not happen. The new blocks of houses are already subjected to the corrosion of time and covered with indentations; they appear to be the abandoned, albeit not yet destroyed “ruins” of modernity. Gronsky’s cities are often completely empty with an inhabited wasteland and rubbish dumps around, as if the people have relocated from clean, habitable areas to a place of sewage and decay. The populace is, in essence, indiscernible from the refuse. They are often seen in the dirt looking like gures so miniature that they become small, insigni cant detail – just as incidental as the surrounding rubbish. The artist carefully selects the point of view, balances the composition, meticulously works out every detail and subtly harmonizes the colour gamut, attempting to avoid super uous colour contrasts which cannot be easily integrated into the whole. There is nothing accidental or improvised about these landscapes. The objects may be quite ugly and formless, but in terms of classical aesthetics, the scenes are extremely beautiful. Both the time of day and the historical moment of his landscapes are unde ned. The effect of this inde niteness is underscored by the desolation of the spaces. If life spreads here, outwardly from the city, why are the new constructions so empty, as if the population had already abandoned them? Is this an end time or a beginning time? The cold perfection of Gronsky’s works would seem to invite this evaluation of his view of the world, particularly as the people in his photographs are tiny gures who hardly stand out from the landscape and do not possess any independent signi cance. Gronsky’s view can be easily identi ed with a totally technological perception of the world. This “subtraction of the human,” the vanishing of the subject, the facelessness of the vision are linked to the disappearance of the “object” and the view’s loss of any intentional orientation on it. And herein lies the paradox of Gronsky’s photographs. By eliminating objects the vision enters, of its own accord, into an unusually intense relationship with the world in all its inde niteness and fullness. Pastoral is a series of enchanting landscapes in which there is virtually nothing to look at. Notwithstanding all their hallucinatory concreteness, Gronsky’s photographs belong far more to the plane of pure vision, appearance and apparition than to the eld of the materiality of the presented objects. And this is their undoubted contemporaneousness and strength.